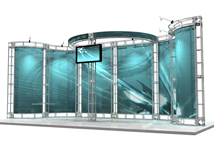 Truss displays are unique display systems that utilize steel truss work to create an interesting and unique trade show display! The truss system frame work can be easily recognized because they are used on almost every major television network and entertainment event in the country. The best feature of the trade show truss display is its ability to expand and reconfigure using the same parts. We can also customize any truss system! We do not charge any custom design charges so you can get a completely unique truss display for a fraction of the cost of most custom displays! 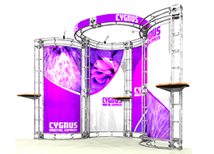 10x10 truss displays are perfect for 10 foot trade show booths. We offer back wall and corner displays so you can find a system to fit your booth space! Custom configurations available! Hardware Kits starting at $2,868! We offer many different styles of 10x20 truss displays. Most of this display systems break down into 10x10 displays. Custom configurations are available upon request! Hardware Kits starting at $4,554! 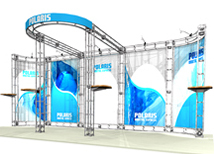 These truss displays are designed for 20x20 and island booth configurations. Almost every display will break down into a 10 or 20 foot display! Custom configurations are available! Hardware Kits starting at $9,222! This gallery showcases a small selection of custom truss systems that are available. You can call us for pricing or request a free 3-D rendering of any custom configuration you can imagine! Truss displays are a great option because they are very easy to recognize at trade shows. Truss sales do not account for a large percentage of trade show booths so you will stand out with a truss system. There is also a subliminal message of strength and popularity because truss systems are seen on all the major news networks and entertainment events. All of our Orbital truss systems are very easy to expand because all the parts are universal. Unlike many display systems, truss displays can be customized by simply adding some parts to make a 20 foot, 30 foot, or large island display! We also carry a large selection of other trade show displays including hanging banners and trade show accessories to help compliment your truss system! Truss systems have a variety of uses including trade shows, expo’s, conventions, marketing events, and store front displays. The versatility of truss makes it ideal for multiple venues and events. The frame work can support monitors, shelves, literature racks, and tables so its very easy to use at any event. Truss can also be used as a product display, a shelving system, or an accent to an existing booth. 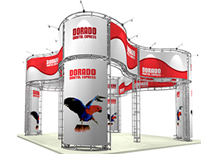 Truss systems are most effective in trade shows because they stand out and make a statement. Orbital truss offers a wide range of benefits; the most attractive feature is the ability to change configurations using the same parts. Every system is comprised of standard lengths and bends. This makes it very easy to change configurations with little to no cost. The ability to re-configure can be a valuable asset to companies that exhibit in multiple booth sizes throughout the year. The steel construction of the components creates a strong display that supports monitors up to 130 lbs with the correct monitor mount. Table tops, internal shelves, and custom shelves are available in four finish choices to match any design. The versatility of the Orbital truss makes it ideal for a variety of events and can work for almost any company. We have a product review on the Orbital truss line that covers even more details on the value of truss displays. Why did we choose the Orbital truss line? The Orbital truss line was specifically chosen because of the quality and graphic finishing options available. Many other truss lines are available, but they lack the development and engineering for perfect graphic fitment. Many systems use grommets and spring attachments that leave graphics looking wavy and cheap. The Orbital truss line is made specifically to work for trade shows and high end events. Orbital truss is one of the original modular truss lines and has been improved and developed over the years to be one of the best systems in the market place. When it comes to truss displays we only offer the best, and Orbital truss is the one truss product line that we trust to offer to our customers.